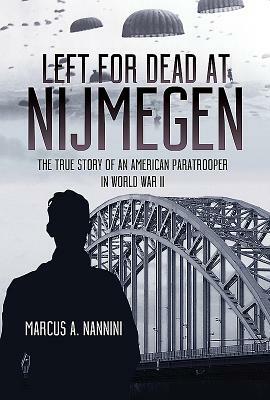 Left for Dead at Nijmegen recalls the larger-than-life experiences of an American paratrooper, Gene Metcalfe, who served in the 82nd Airborne during WWII. From his recruitment into the military at Camp Grant to his training with the 501st Paratroop Infantry Regiment at Camp Toccoa, it wasn't until D-Day itself that he first arrived in England to join the 508th PIR. When Metcalfe boarded the C-47 which would drop him at Groesbeek Heights, just outside of Nijmegen, Holland, he was handed a box of twelve dozen condoms by an overconfident British lieutenant. He was to be among the first to jump into what should have been a picture-book meadow, free of German troops. Instead, it was defended by three German antiaircraft cannon emplacements. As he jumped into a hail of bullets and exploding shells he watched his plane roll over and plummet into the ground. It was at that moment he realized the condoms had either been a bad joke or the planners of Operation Market Garden had seriously underestimated German resistance. Gene was listed as KIA and left for dead by his patrol, who presumed the worst when they saw his injuries from a shell explosion. The rest of his story is equally gripping, as he became a POW held outside Munich, being moved between various camps ridden with disease and a severely undernourished population. Eventually, after making an escape attempt and being captured within sight of the snow-capped Swiss mountains, his camp was liberated by American troops in April 1945. Gene's story is both remarkable for his highly unusual encounter, and his subsequent experiences.